Series L is best known as the housing for the little fire alarm beacon from deegee, with both the xenon and the halogen-lamp rotating mirror versions extremely popular in this application. The Polycarbonate lens of Series L has optimised external ribbing to maximise available light transfer, enhancing long-range visibility. The ABS white or black base is moulded with fixing drill-outs on 51mm centres for direct conduit box mounting and with alternative 3 drill-outs on 100mm PCD. A moulded central 20mm diameter drill-out is located in the base for cable entry. Standing at only 133mm tall, and with a base diameter of 123mm, Series L is a small beacon with an excellent light-spread, making it a perfect solution for smaller offices, walkways, corridors, classrooms, etc. The lens allows for 360o all round and 270o all-over viewing, and with a range of voltages of the xenon units, from 12V UC up to 240V DC and 230 V AC, the beacon works in many applications. 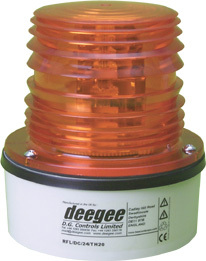 Series L is also available as a vehicle beacon fitted with a rubber base, to either fix directly to a vehicle (ideal for motorbikes, forklifts and general vehicles) or with a magnetic insert and a curly extendable cable to plug into a cigarette-lighter fitting for quick and easy removal and security when the vehicle is left unattended. A stainless steel cage guard, stainless steel and polycarbonate wall-mounting brackets, and a pole mount are all available as optional extras with Series L.